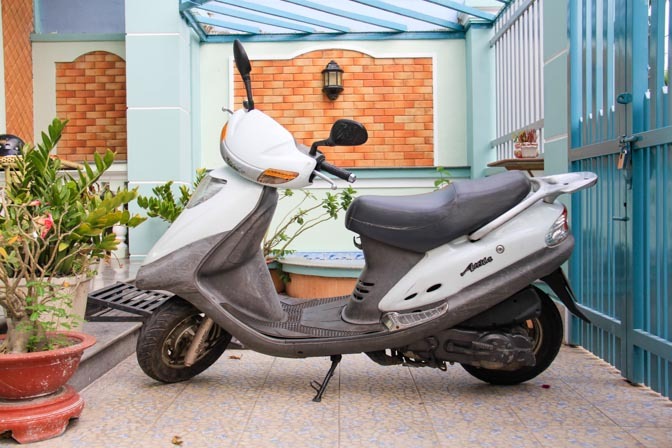 Also, like any vehicle, the resale value isn’t great — once you drive a new motorbike off the lot you can knock off a quarter of its value, so don’t think you’ll be able to sell your 2 year old scooter for anything close to what you paid for it. On the other hand, a 10 year old scooter is almost worth the same as a 12 year old one. I’ve bought two used bikes in Vietnam — this morning I was very close to buying a third (it’s addictive). Here’s what I’ve learned about the process. There are a bunch of places to get bikes owned by foreigners, or by people who are looking to sell to foreigners. Here’s a breakdown of a few online sources. In order to compare them, I’ve checked all the sites to see how much the average Honda Dream is (a popular backpacker’s bike). Wheelie Marketplace – Similar to Travel Swop. Cho Tot – This is where a Vietnamese person might shop online for used products. It’s only in Vietnamese, so you might want to get a translator, but all you really need to know to get started is that xe may means scooter. There are lots of great deals on here, but you’ll need help from a local. Phuong Nam – another website that sells second hand items. 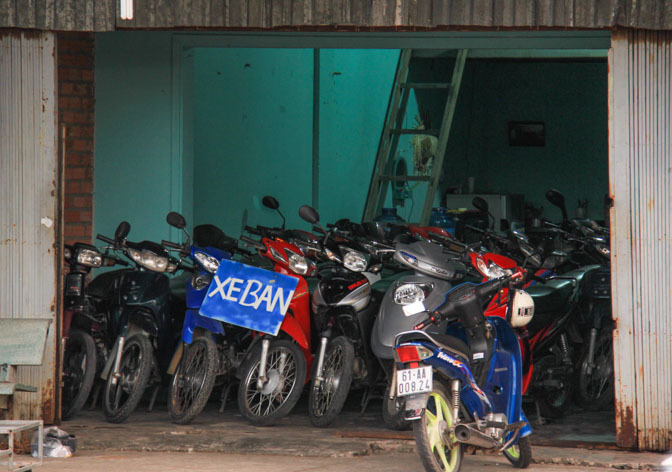 Only in Vietnamese, but everything is pretty self-explanatory, and a lot of the bikes are in motorcycle stores around the cities, so you could use it for research and pop in to the store to test drive it. If you’re looking for the best deal, you might be better off avoiding that list and simply hitting the streets. Look for signs on bikes that say xe bán. This means vehicle for sale. You should be able to find some used bike stores that will have a wide selection. Bike repair shops sometimes have a couple bikes for sale out front. These are probably good options, because you know the bikes have been carefully looked at by a professional. If you want to go this route, it’s important to shop around a bit. Look at the websites previously mentioned and get an idea how much they are selling the type of bike you want for. To a Vietnamese sales person, a non-Vietnamese person just looks like some dollar signs taped together. You might have to go to multiple shops to find an honest person that will give you a fair price. Don’t be afraid to barter. Bring something to write numbers down with, or use your cell phone. Better yet, bring along a Vietnamese person with some experience. This largely depends on what type of person you are. If you want something showy, there are a lot of cool vintage bikes that have been fixed up. Saigon Scooter Centre has old Vespa’s that have been updated with new engines. They’re real sharp looking, but costly. If you just want something straightforward, easy to use, inexpensive, reliable, and with enough power – I recommend a SYM Attila. They are fully automatic, so you don’t have to worry about shifting gears or stalling it. They are made from quality parts unlike some of the Honda bikes that have often been repaired with cheaply made Chinese parts. You can take the Attila to a SYM dealership if you need to repair it, which reduces your chances of being ripped off. They’re also a bit larger than most of the scooters available in Vietnam. I’ve heard about multiple backpackers that have rode them from Saigon to Hanoi (over 1500 km). They go about 28 kilometers per litre or 80 miles per gallon. They are very affordable. In Vietnam, everyone wants the latest thing whether it be the new iPhone or the new model of Attila. This means perfectly good Attilas are being sold at great prices ($200-$300). They’ll be about 10 years old, but as long as it was well maintained it should be fine. This means oil (dầu động cơ) changes every 5000 km, and oiling the transmission every 10,000 km (đầu nhốt xe máy means transmission oil). The only downside to the Attila is that it looks like a spaceship mated with a jet ski. Newer models are actually pretty sharp, but you’ll have to pay a $650 (for something about 7 years old) to $1700 (for a brand new one). Note: These prices are from 2014. As we get further away from this year, I would consider going a step up from the 2004 Attila, as they are getting a little old and the newer versions are dropping in price. Despite the jet ski like appearance, you can’t drive it in the water. 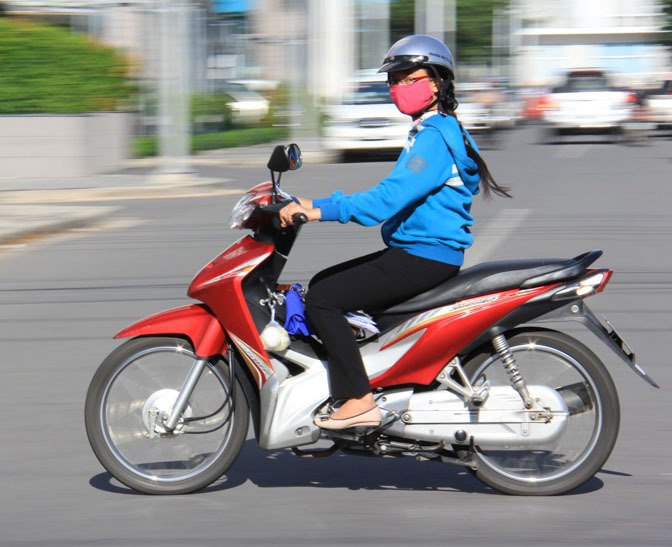 Before you throw your money down, make sure that the bike comes with a registration card (a little blue card that has a serial number, make and model, name of the original buyer, etc). You’ll need this to avoid getting your bike impounded. Every bike should also come with a license plate. Engine – put the bike on its centre stand (make sure the back tire is off the ground), start it up, gun the engine. Listen for clicks, knocks, and anything else that sounds bad. The engine is probably the most expensive thing to fix, so this is important. Gears – test every gear if you can. If you can test drive the bike this shouldn’t be hard, but if you are running it on the bike stand it might be tougher. The transmission is probably the second most expensive thing to fix. Tires – Check to see how worn they are and if they are wobbly. If just the tread looks worn down it’s a pretty cheap fix, but if the tire wobbles when it spins then you’ll probably need to buy a whole new wheel. Mirrors – not a huge deal because they’re cheap, but a lot of bikes will be missing mirrors. Speedometer/Odometer – These break often and easily. Most bikes in Vietnam don’t have working ones. Neither of my bikes have speedometers, but I don’t think it’s much of a problem. You rarely even have the chance to go over the speed limit. An odometer is handy for knowing when to get your oil changed, but unless you are going a long distance, you can determine that by time. Fuel gauge – another item that rarely seems to work on Vietnamese bikes. I’m used to not having a fuel gauge on my motorcycles, so it’s not a problem for me at all. Having repairs done is a good way to get a bit more bang for your buck. If, say, everything looks great except the back brake, don’t be afraid to ask them to get it fixed before you agree to buy it. Most places that sell bikes will have a mechanic that they can get cheap repairs from. When a deal has been made you pay the person, they give you the keys and the blue card, you drive away. That’s it. If you haven’t learned how to drive yet, you can probably easily haggle free delivery. Learning to ride will be easier at home where you can take it slowly, as opposed to learning on your way home from the motorbike store and risk wrecking your new set of wheels. Can you email me a photo – [email protected] I can send it around to some people I know who might be interested. Is it a Nouvo?